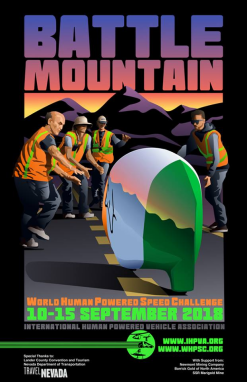 During the week of September 10th through 15th 2018, cyclists, engineers and enthusiasts from around the world will again gather in the Nevada desert to break human powered speed records. The attempts will be held on State Route 305 outside of Battle Mountain, Nevada. In 2016, the overall speed record was set at 89.59 MPH(144.17 KPH), by Todd Reichert of Team Aerovelo. See more at the WHPSC at Battle Mountain site!